The city of Keller is thriving suburban city that prides itself on "successfully balancing big-city comforts with small-town charm." From the fantastic location to the unique dining and shopping experience, Keller is ideal for living in a premier location within the Dallas- Fort Worth metroplex. Keller is known for having exceptionally low crime as rated in the Dallas Morning News two years in a row, as well as having an abundance of amenities. From miles of hike and bike trails and parks to in-line hockey, as well as soccer, basketball, baseball and volleyball fields, Keller really has it all. Not only does this city provide an excellent quality of activities, they are known for having a fantastic school district. It serves nine cities in the area with 23 elementary schools, 12 middle/ intermediate schools, and 5 different high schools. Also, there are 20 major universities within a 60 mile radius of Keller including Southern Methodist University, The University of North Texas, Texas Christian University, and The University of Texas at Dallas. Rated as one of the best small cities in America, as well as one of the best Texas cities for finding a job, the opportunity Keller provides is limitless. 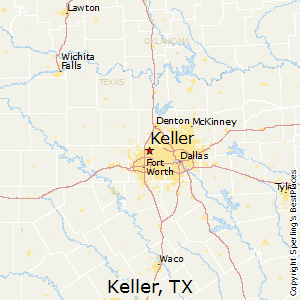 To explore more about the fascinating city of Keller, check out these links.